The 20 ft flat rack sea container does not have fixed end walls, but collapsible ends, best used for storage and cargo of heavy items. These 20 ft flat rack second hand containers allow for easy loading and unloading, and are used to transport and store bulky items. Made with tough corten steel, the collapsible end flat rack shipping container is sturdy, weatherproof, reliable, and cost-effective. 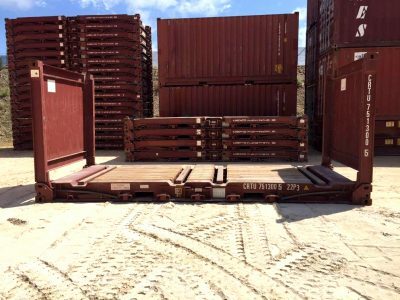 20 ft flat rack collapsible end shipping containers are proudly Australian owned and made for long-term usage.